An example of a Gallery Book made by Dolores. 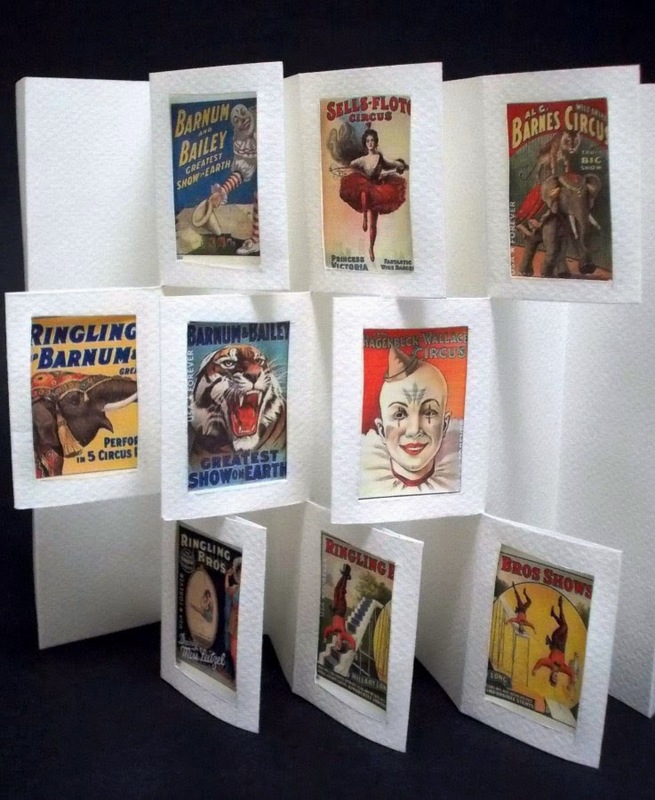 Dolores Guffey will be teaching us how to make this classic book structure known as a Gallery Book. When the book is opened it gives the impression of framed paintings hanging in an art gallery. You will need 9 images in portrait layout. They need to be cut 1-1/2" x 2" size, but the image will appear through a 1" x 1-1/2"opening (see note below). When you cut your 1-1/2" x 2" images, keep in mind that you will lose 1/4" on all sides that will be behind the frame of the window opening – so your viewed image should not go beyond the 1" x 1-1/2" window opening. To help you gather your images, cut out a piece of paper 1-1/2" x 2" and then mark 1/4" in on each edge and cut out the window. Now you have a template to place over whatever you are planning on putting in your gallery. Note on images: these can be photographs; images cut from magazines; rubber stamped images; abstract images; cancelled stamps; zentangles; etc. The images for the sample book shown on this page are from U.S. postage stamps which were scanned into the computer and re-sized to fit the measurements for this workshop. Note on Mi-Teintes: Prior to coming to the meeting, please have your Mi-Teintes cut 6" x 25-1/2" – when you cut the 6" strip, make sure you cut from the edge that does not have the embossed logo running along the edge. We will be using the full 25-1/2" length to make the book. The finished size of the book, when folded shut, is 6" high, 1-1/2" wide, and 1" thick. When opened, it is approximately 6" x 10". You can color-coordinate your Mi-Teintes with your images, or go with a light neutral color such as white, beige, or light gray. You will have enough paper left over to make two more books of the same size; or you can add length to your original book by folding the additional 6" strip (or strips) and connecting to end of the original book. RSVP: Yes, please. Dolores will have a full set of instructions as well as some acetate templates and does not wish to copy and cut more than necessary. So please be kind and RSVP (contact info for Dolores is in the newsletter). We will be meeting Saturday, June 14 in our usual location on the HSU campus.